(Reuters) - John Kerry will visit nine countries in Western Europe and the Middle East on his first trip as U.S. secretary of state to consult allies on topics including Syria's civil war, the State Department said on Tuesday. Kerry will travel to London, Berlin, Paris and Rome, where he is expected to attend a gathering of senior officials from nations supporting the Syrian opposition and to meet with opposition members. The emphasis on traditional U.S. allies in Europe and the Gulf on the February 24-March 6 trip differs from that of Kerry's predecessor Hillary Clinton, whose inaugural journey as the top U.S. diplomat took her to Japan, Indonesia, South Korea and China. Nuland played this down, saying that if Kerry had added an Asian stop, "an already long excursion would be even longer." 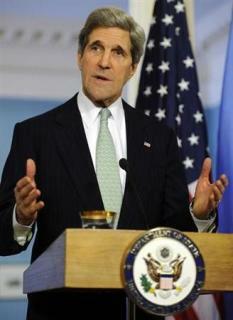 Kerry was likely to visit Asia early in his tenure, Nuland said. He will not travel to Israel and the Palestinian Territories on this trip, she said, because Israeli Prime Minister Benjamin Netanyahu is working to form a government after the country's January 22 election. The spokeswoman said Kerry thinks of the trip, his first since taking over from Clinton on February 1, as a "listening tour" that will allow him to touch base with key allies in Europe and the Middle East and to focus on the upheavals in the Arab world. One theme, she said, will be confronting "the challenge from extremists seeking to hijack some of the Arab Spring revolutions." Kerry wants to discuss "how we are approaching that whole complex of issues from Libya, to Tunisia, to Egypt, to Syria (to) the combined challenge of Iran," she added. In Egypt, Nuland said the new secretary of state plans to stress the importance of "encouraging greater political consensus and moving forward on economic reform." The country's economy has steadily deteriorated, with foreign exchange reserves dwindling, tourism drying up and the currency, the Egyptian pound, having lost 14 percent of its value since the 2011 revolt.